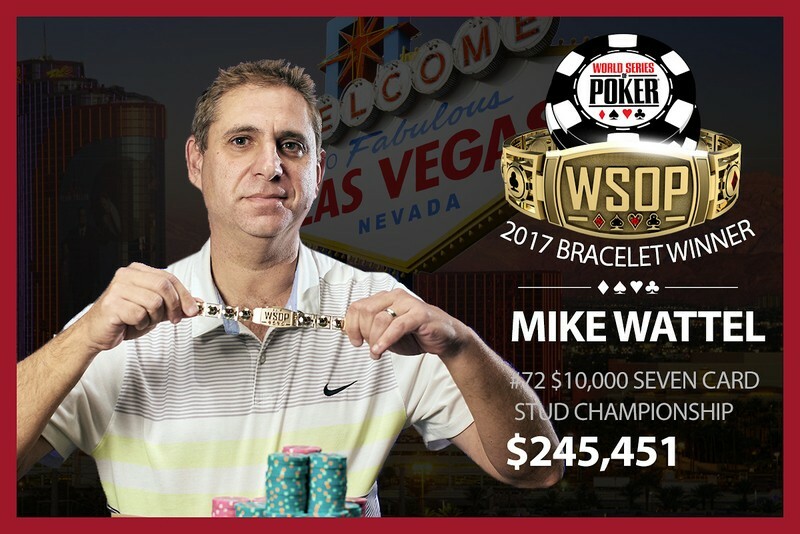 Mike Wattel won his first World Series of Poker gold bracelet back in 1999, taking down a $1,500 Omaha eight-or-better event. The mixed-games specialist from Chandler, Arizona then spent the next 18 years trying for bracelet no. 2, coming close time and time again. Between 2000 and 2016, Wattel added 24 top-ten appearances to his WSOP poker resume, including four runner-up finishes, but the second bracelet eluded him. Early Monday morning, however, the 46-year-old poker pro was able to shake the monkey off his back to take down the $10,000 stud championship event and the $245,541 first-place prize. Despite a modest field size of just 88 players, the final table attracted a lot of attention from the poker world because of the stacked line up, and of course, the presence of runner-up Chris “Jesus” Ferguson. Ferguson, who was one of a handful of men behind what the U.S. government said was a “global Ponzi scheme” with Full Tilt Poker, has been a highly controversial figure at the summer series since making his return in 2016. This summer has been particularly tense as Ferguson competes for the WSOP Player of the Year title. The five-time bracelet winner has cashed 16 times, making two final tables, for a total of $376,203. The final table also featured John Monnette (5th), who is also among those gunning for WSOP POY honors. Monnette has cashed 14 times, made four final tables and won his third overall bracelet in the $10,000 2-7 lowball draw championship. Perhaps the only player at the final table with a more impressive summer was Bryce Yockey (6th). Yockey only has five cashes, but he’s made the most of them. He started off by finishing fifth in the $1,500 Millionaire Maker for $317,544. Then he won his first bracelet and $511,147 in the $10,000 pot-limit Omaha eight-or-better event. Last week, he took fifth in the $25,000 pot-limit Omaha championship for another $270,242 and his most recent final-table appearance earned him $40,066. Other notables to make the money included Perry Friedman (3rd), Shaun Deeb (7th), David Benyamine (8th), Randy Ohel (10th), Jason Mercier (11th), Todd Brunson (13th), and Shirley Rosario (14th).